Elizabeth Liedhegner is the laboratory manager of the research laboratories in the Department of Biomedical Sciences. She is responsible for teaching graduate level classes and assisting graduate students and faculty in their research. She also facilitates the development and administration of outreach programs to promote biomedical careers. 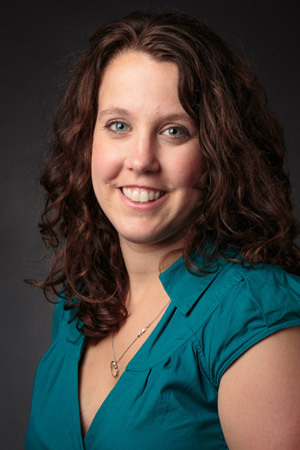 Her goal is to provide graduate students and faculty assistance in development of research projects, optimization of research protocols, and assistance with laboratory techniques. She hopes to be a sounding board for graduate students to aid in their successful completion of the program. Her expertise comes from 10 years of research experience where she was able to develop research goals and test hypotheses. She has successfully developed projects utilizing and troubleshooting multiple experimental techniques. Her passion lies in the discovery of novel ideas and imparting her love of research to new students. Liedhegner, E. S., Sasman, A., & Hillard, C. J. (2014). Brain region-specific changes in N-acylethanolamine contents with time of day. Journal of Neurochemistry, 128(4), 491-506. Liedhegner, E. S., Vogt, C. D., Sem, D. S., Cunningham, C. W., & Hillard, C. J. (2014). Sterol carrier protein-2: Binding protein for endocannabinoids. Molecular Neurobiology, 50(1), 149-158. Sabens Liedhegner, E. A., Gao, X. H., & Mieyal, J. J. (2012). Mechanisms of altered redox regulation in neurodegenerative diseases – Focus on glutathionylation. Antioxidants and Redox Signaling, 16(6), 543-566. Sabens Liedhegner, E. A., Stellar, K. M., & Mieyal, J. J. (2011). Levodopa activates ASK1 through oxidative dissociation of protein modulators and induces cell death. Journal of Chemical Research and Toxicology, 24(10), 1644-1652. Sabens, E. A., Distler, A. M., & Mieyal, J. J. (2010). Levodopa deactivates enzymes that regulate thiol-disulfide homeostasis and promotes Neuronal cell death – Implications for therapy of parkinson’s disease. Biochemistry, 49(12), 2715-2724. Sabens, E. A., & Mieyal, J. J. (2009). Glutaredoxin and thioredoxin enzyme systems: Catalytic mechanisms and physiological functions. Massala, Mazza, G., & Hoboken, G. (Eds.). Glutathione and Sulfer Amino Acids in Human Health and Disease, 121-156. Mieyal, J. J., Gallogly, M. M., Qanungo, S., Sabens, E. A., & Shelton, M. D. (2008). Molecular mechanisms and clinical implications of reversible protein S-glutathionylation. Antioxid Redox Signal, 10(11), 1941-1988. Offer, T., Ames, B. N., Bailey, S. W., Sabens, E. A., Nozawa, M., & Ayling, J. E. (2007). 5-methyltetrahydrofolate inhibits photosensitization reactions and strand breaks in DNA. The FASEB Journal, 21(9), 2101-2107.
International Cannabinoid Research Symposium travel award (2012) National Institutes of Health (NIH). International Cannabinoid Research Symposium travel award (2011) National Institutes of Health (NIH). Postdoctoral poster presentation winner (2011) Milwaukee Chapter Society of Neuroscience. 3rd place poster presentation (2010) Research ShowCASE. Gordon Research Conference Travel Award (2010) National Science Foundation. Biomedical Graduate Student Symposium poster presentation winner (2009) . Predoctoral Fellowship: NIH Institutional Metabolism Training Grant (T32 DK007319) (2009) National Institutes of Health (NIH). Greenfield Travel Award: Best journal club presentation (2006) CWRU Department of Pharmacology. Predoctoral Fellowship: NIH Institutional Molecular Training Grant (T32 GM008803) (2005) National Institutes of Health (NIH).